The dataARC tool is designed to enable synthesis research, by allowing non-specialists to access and understand specialized datasets. 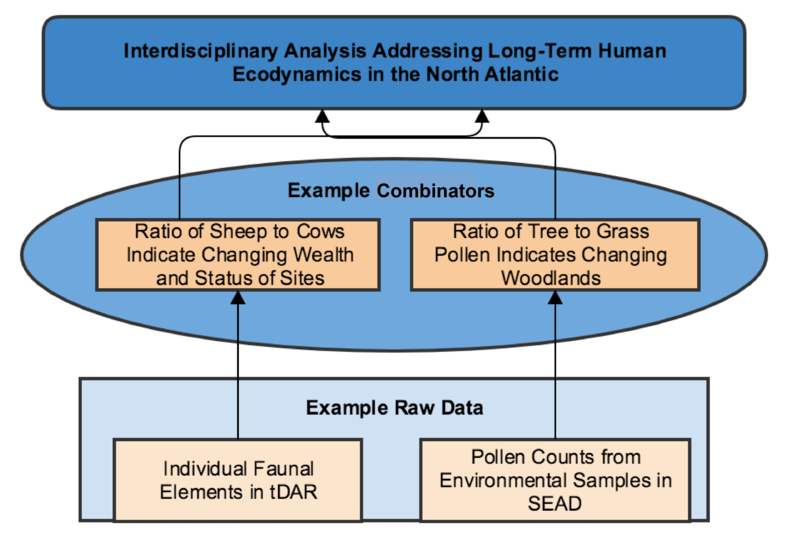 For example, you may be a researcher that specializes in pollen analysis, but are interested in the implications of faunal data found at archaeological sites across the North Atlantic to better understand resource access and use. The ability to understand and analyze raw faunal data, however, needs extensive training, making it difficult for other researchers without this training to use these data. For this reason, dataARC is focusing on making data accessible at the middle of the figure to the left - what we are calling 'combinators' - in which specialists have created meaningful combinators that can allow for more powerful analysis by those doing interdisciplinary research. While the raw data are still archived and accessible at partnered repositories (for example, tDAR or Tephrabase), dataARC will provide results at the combinator level, allowing for researchers to access data that can more easily contribute to interdisciplinary, synthesis research.